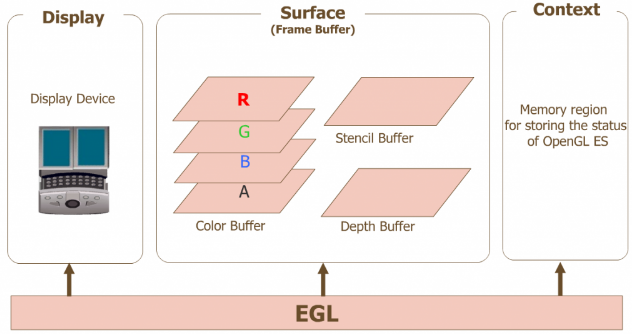 EGL is an interface between Khronos rendering APIs such as OpenGL ES or OpenVG and the underlying native platform window system. EGL replaces GLX/AGL/WGL with a platform independent implementation. PCIe&AGP graphics hardware is dedicated high-speed bus that allow the graphics controller to fetch large amount of data directly from system memory. It uses a Graphics Address Re-mapping Table to provide a physical-contiguous view of scattered pages in system memory for DMA transfers. DMA ::: In the DMA model, the primary graphics memory is the local memory associated with the accelerator, referred to as the local frame buffer. 3D structures are stored in system memory, but are not used (or executed) directly from this memory; rather they are copied to primary (local) memory (the DMA operation) to which the rendering engine’s address generator makes its references. This implies that the traffic on the AGP tends to be long, sequential transfers, serving the purpose of bulk data transport from system memory to primary graphics (local) memory. This sort of access model is amenable to a linked list of physical addresses provided by software (similar to the operation of a disk or network I/O device), and is generally not sensitive to a non-contiguous view of the memory space. X server log file also contains useful info about driver installation.